Today the library director for our distrct stopped by to talk with me about the transformation plan for my library. 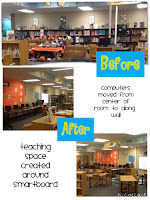 See, she has a vision of what libraries should look like and offer students, It is a vision of makerspaces, collaboration areas and really knowing what the students want and need from the library. Last year, she told us about this "transformation" plan. 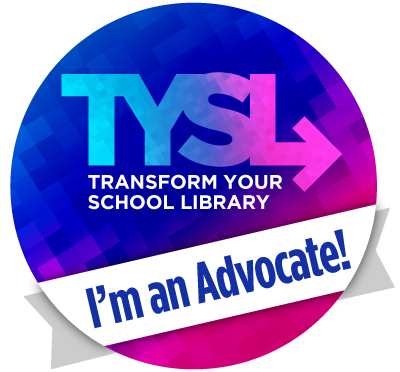 We were supposed to think about how we could change our libraries to be more innovative and relevant to today's students. So I set to work genrefying my fiction collection and creating a teaching space by my smartboard by removing shelves and moving computers from the middle of the floor to against the wall. Last month at our library meeting, she made a comment about phase 2 of the transformation process. Alarms started going off in my head. Phase 2? I transformed already. I thought I was done. What more could I do? She says...Start with a blank template of your library, no shelves, no furniture and think about how you could make the space innovative and functional. What would you do? What would you change? Ask the students. What do they want to be able to do in the library? But I pretended like I was cool with this and I even asked her to come out and take a look at my space and give me some ideas about how I could redesign. And so she did... and now I am hyperventialting! What if you moved your chapterbooks to the other side of the library and your Everybody collection over here? Then you could remove these shelves and this would be a great place for your makerspace. You could get tables that lend themselves to collaboration and have some comfy collaborative reading areas here and here... I smile and nod and try not to pass out. They are speaking to me. My PLN knows what I need to hear tonight. Another example of how being connected is so valuable for growth. And so I'll go to sleep tonight. Return my breathing to normal. Bring my assistant some donuts in the morning. And together we will make a plan to transform our library...one step at a time.